Dana Choga is a food chain with outlets across India. 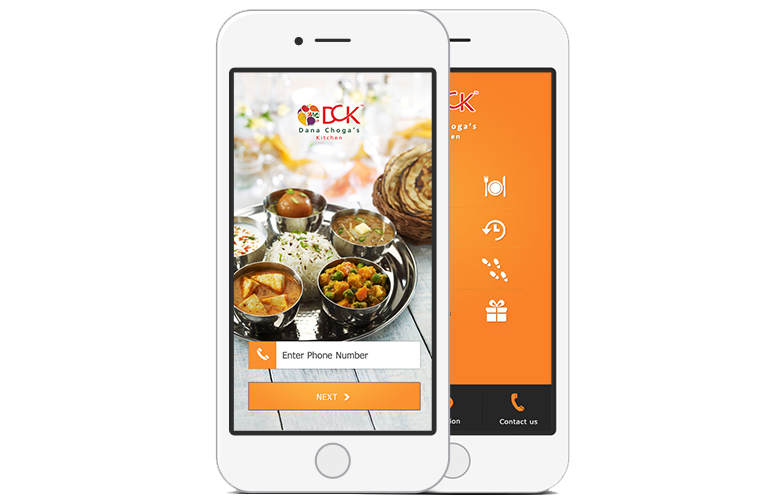 They needed a Mobile Application to reduce the call center load and to improve the user experience of ordering food much more convenient and with a shorter response time. Navyug designed the Application Architecture and developed the entire application. Client: Vrinda Foods & Hospitality Pvt. Ltd. The Client requirement was to develop a mobile application that ‘talked’ to their back-end and provided a uniform user experience across different mobile platforms (Android and Windows). The need was for a pleasant and ‘easy to use’ user interface for ordering food which did not require an interaction with the call center at any point. Help the customers by letting them search for and apply discounts to orders on the app itself. Visits and interaction with staff and business owners. Balsamiq mockups of the solution. Poker Planning, Agile methodology with daily standups, sprints and retrospectives. Code and Progress of work shared with Client on Git and Trac. Daily 15 min interaction with Client during stand-up, to ensure maximum communication and quick reactions. Provide Users the ability to easily order food, select and apply discounts and pay for their orders online. Functionality for a User to track an order. Store an order and use the same for repeat orders. Other features like Location of nearby outlets provide Feedback and Contact the Head Office. The App helped DANA CHOGA immensely by increasing their daily orders, streamlining their orders and delivery processes and reducing response time. Customers could now place orders online using the mobile app without any interaction with a call center – thus reducing load on the call center & saving costs by 25%. Users were provided a number of value added features like finding nearby outlets, applying offers, saving orders for future re-ordering and contacting the Dana Choga Head Office, if required, thus helping decision makers understand the customer better.